Europe is merging closer. Facts for this are the European Community or the new European currency Euro. But what about a homogeneous Geospatial Data Infrastructure? The requirements for that are a common data model, similar data capturing methods and metadata in several languages. The most fundamental model aspects of geospatial data are coordinate reference systems like geodetic reference systems and map projections. They are the frame in which coordinates as the holder of the geometric information get their spatial semantics. In Europe, the landscape of coordinate reference systems is very heterogeneous because mostly every country built up its own reference systems. Most of them have their own history and lineage. So, most of them originally have no relations to other nations reference systems: they do not have a common geodetic datum. On this level of modelling geospatial data, a comprehensive georeferencing model is required to homogenise coordinate reference systems. If homogenisation is reached, geographic locations get the same mathematical location, i.e. that overlaying data from different sources fit together not only in reality but also positionally within GIS. For reaching a homogeneous positional overlay, the first step is the identification of the coordinate reference system entity in which your data is stored. A second step is to find the geometric relation to the target reference system together with the functional model for the changing process. The MapRef internet collection is an approach to support users when homogenising geospatial data from different coordinate reference systems. MapRef collects definitions and parameterisations of coordinate reference systems like geodetic reference systems and map projections, sorted by countries. Furthermore, it also includes geodetic datum transformation parameters to global systems as WGS84, the system in which GPS originally works. In MapRef, you also find other related information on coordinate reference systems, as theory, related links and additional information. The presentation gives you an introduction to the MapRef-pages. The first method is a cognitive one, the second one is a mathematical or geodetic one. Geographic identifiers use thematic and logic models to describe and assign a geographic location. This method of spatial referencing is not followed within this discussion. Spatial referencing by coordinates has its basics in mathematics and analytical geometry. Generically, a location is described by a set of coordinates which refers to a coordinate system. But further on, spatial locations need coordinate systems with spatial (or geographic) semantics. Such spatial coordinate systems are called coordinate reference systems. A coordinate system is defined by its origin, its axes and units, a coordinate reference system needs its spatial extension, the position and orientation of the axes in relation to the earth. This spatial extension is called the datum. There exist various classes of coordinate reference systems. Here, we only focus on the classes for geodetic reference systems and map projections. Let's have a look at Fig. 1 what the main issue is. the geoid - the geophysical or gravitational one. The geoid is a surface perpendicular to the plumb lines. It is the continuation of the mean sea level surface at the continents. The geoid is the reference surface for heights, particularly the orthometric heights. the spheroid and sphere - a mathematical and symmetric surface. The spheroid (ellipsoid) is a sphere flattened at the poles. It mainly is used for describing a horizontal position (e.g. by geographic coordinates). Let's conclude: the geodetic reference systems are the geoid for the heights and the spheroid (ellipsoid) for the horizontal. In Fig. 1b we see an ellipsoid as a reference for the horizontal position, and for the heights, a digital elevation model as an approximation of the topographic surface is given. Each height- information is assigned to a horizontal position, but the height is not referred to the ellipsoid, but influenced by and related to the gravity field. (this leads to the problem of geodetic hybridity when modelling coordinate reference systems). In Fig. 1c,d, it is shown that ellipsoids may vary by their shape and size as well as by their position. This means that various geodetic datums exist. E.g. in Europe, there is a big heterogeneity. Mainly each country uses or used its own reference systems. Some may use the same ellipsoid but a different datum, but also various ellipsoids are in use. Of course, there exist various efforts to unify the geodetic reference systems. One example is the European Datum 1950 with is/was used by NATO and primarily for militarian mapping. A newer effort is the EUREF Campaign which led to the ETRS89 (European Terrestrial Reference System 1989) together with its control point field, the ETRF89- Frame. Since this frame is realised, many countries defined new national geodetic reference systems which are referred or equal to ETRS. Fig. 1e finally shows the way from geodetic or geographic coordinates to the national grid coordinates or generically to the planar coordinates of a map projection. A national coordinate grid, as used for topographic mapping, is based on a map projection, mostly based on a conformal one. But for thematic mapping also other geometric properties as equal- area projections and equidistant projections are in use. In Fig. 1e, it is shown that most projections use a conic map projection surface (cylinder, cone, plane) which is flattened to the plane. The implementation of map projections has a much wider amount of map projection instances for authoritative mapping than for Earth models. Why? Map projections have distortions. Only for a characteristic and type dependent area, these distortions are small enough that they are smaller than the accuracy of drawing the map elements. Because of that, for larger counties as e.g. Austria, Germany, France, Sweden etc, map projection zones are used. In various European countries, also different projections are used for mapping at different scales. We have seen, there exist various ways for choosing a coordinate reference system for mapping. In other words, the same spatial location may have different coordinates in different maps or datasets. When using datasets from different sources but covering the same area, it may require a homogenisation of these sets by means of coordinate reference systems. Conversions: the relation between the coordinate reference systems is set by definition (the method as well as the parameters). E.g. the application of a map projection is a conversion of coordinates from the reference surface to the projection plane or vice versa. Planar transformations: e.g. used for georeferencing map sheets or scanned maps. Geodetic datum transformations: used for changing the geodetic reference system. In Fig. 2, these main georeferencing processes are shown. Planar transformations, used e.g. when digitising or scanning maps, inverse projections as conversions, and geodetic datum transformations for the change between two geodetic reference systems. Various coordinate reference systems were defined and implemented by authoritative bodies and organisations. These systems have a specific datum based on their definition (initialisation). E.g. national mapping agencies decided for a map projection (system) together with its underlying geodetic reference system. Their definitions are constant, and this information may be required for many georeferencing processes. For these two groups of coordinate reference systems, it is a comfort to have the required parameters and methods collected and published or implemented. Many GIS- Software implementations support the functionality for georeferencing, as well for planar transformations as for map projections and datum transformations. A lack still is to get the correct parameters. Therefor, the MapRef- pages are built up. 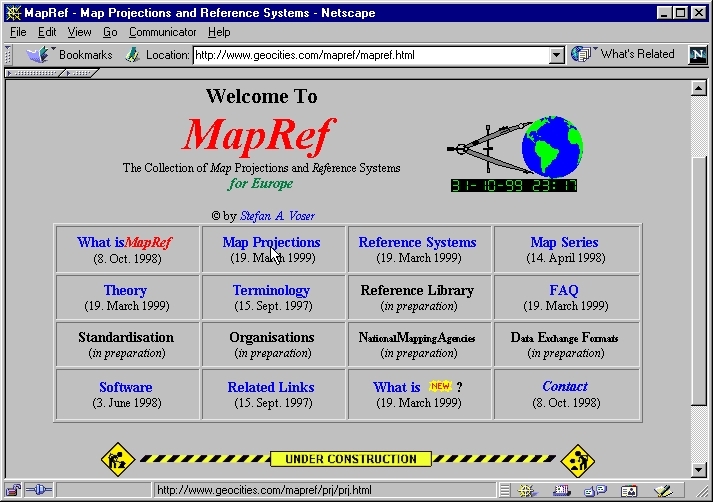 The MapRef Web- Site is an internet collection of information about map projections and reference systems. The main focus is done on the definitions and parameters for map projections and geodetic reference systems in Europe. The MapRef pages are designed for the following information. Not all themes are included or completed yet. Definitions and parameters of map projections, sorted by European countries; parameters, sample data; references. Definitions and Parameters of geodetic reference systems, sorted by European countries; parameters, sample data; references. Map Series, sorted by European countries; related reference systems; links. The mathematical basics of mapping. Links to tutorials and other related sites. Terms, glossaries and acronyms; links. Publications, books and libraries; links. National offices for mapping and geodesy; links. National or international bodies in the field of Cartography and Geodesy. What are the standardisation efforts for Coordinate Reference Systems? Data Exchange Formats. Ready for CRS? If you have questions, please check here first. If you really need help or have interesting information to be included. In the following, only the main characteristics of the definitions or specifications of map projections and geodetic reference systems are discussed more in detail. These characteristics are all important when choosing a map projection for a certain purpose. A main problem when using implemented methods is their identification. The same method may have different names, or also different mathematical approaches etc. This information will be collected in the map projection collection, sorted by countries. 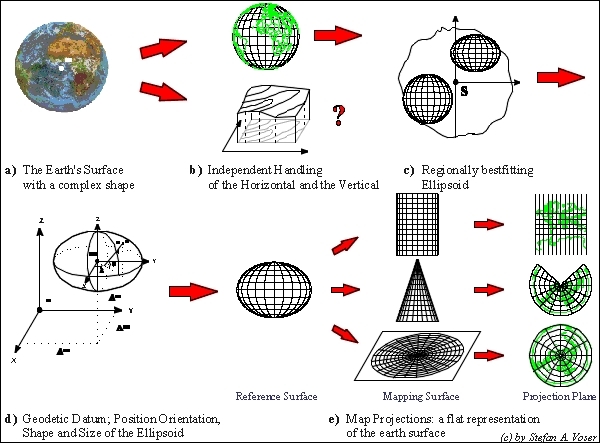 At the beginning, we have seen that geodetic reference systems are used for modelling the figure of the Earth. When modelling the Earth for flattening it by a map projection, spheroids and spheres are used because of their geometrical smoothness. Such a model has geometric properties, describing the shape and size of its figure. And the datum describes the position and orientation regarding to the Earth (and its surface). Before artificial satellites became reality, the geodetic datum was determined by astronomical measurements. Based on such measurements and regarding to the earth curvature for the specific country, the best fitting spheroid was oriented and positioned in its (national) datum. Normally, a fundamental point (e.g. the Panthéon in Paris, the old observatory in Berne, the observatory Monte Mario in Rome etc.) was used for fixing the spheroid in its datum (Fig. 1c,d, Fig. 2c). By this astronomical definition of the datum, the Earth model stood for its own, and no relations to other geodetic datums were known or fixed. Important is that by this way, the position and orientation to the Earth centre (mass point) was unknown. Since the use of artificial satellites (e.g. TRANSIT, GPS) is applicable for navigation and also for geodesy, global (world- wide) geodetic reference systems were built up (e.g. WGS72, WGS84, ITRS89), positioned in the Earth centre, oriented by the mean rotation axis and the meridian of Greenwich. These principles may have different implementations. They may vary in its signs, or they are implemented at curvilinear methods, meaning a direct transformation between the geographic coordinates related to the two ellipsoids. This information will be collected in the reference system collection, sorted by countries. Not included here are the heights systems or the geoid models, because they belong to a more complex thematic. The MapRef-Pages are not funded by any organisation or institution, they are one aspect of my work towards my PhD. Because of that, they have an experimental touch, are not complete and may change. The initiation for the pages was given by the Project "Geodetic Reference Systems and their Applications to the Field of Nature Conservation", which I realised from 1994-1996 at the Institute of Geodesy, University of the Federal Armed Forces, Munich, funded by the German Federal Office for Nature Conservation. Coordinate Reference Systems are the mathematical fundamentals for storing spatial data with its geometry. A management is required to homogenise spatial data from heterogeneous coordinate reference systems using georeferencing processes. For many georeferencing processes, the required information is missing (e.g. the parameters of the map projections and datum transformations). The MapRef pages are built up to collect such information. At European level, MEGRIN (Multipurpose European Ground Related Information Network) now started an initiative to build up a similar European collection. Bugayevskiy 1995 Bugayevskiy Lev M., Snyder John P.: Map Projections, A Reference Manual, Taylor&Francis, London, Bristol 1995. Hooijberg 1997 Hooijberg Maarten; Practical Geodesy – Using Computers. Springer Verlag, Berlin Heidelberg, 1997. Moritz 1990 Moritz Helmut: The Figure of the Earth – Theoretical Geodesy and the Earth’s Interior. Herbert Wichmann Verlag Karlsruhe, 1990. Richardus/Adler 1972 Richardus, Peter; Adler, Ron K.: Map Projections, for Geodesists, Cartographers and Geographers. North Holland Publishing Company, Amsterdam 1972. Snyder 1987 Snyder, John P.; Map Projections - A working manual; U.S. Geological Survey Professional Paper 1395; Washington 1987. Voser 1998 Voser S. A.: Schritte für ein automatisiertes Koordinatensystemmanagement in GIS und Kartographie. (Steps Towards an Automated Coordinate System Management for GIS and Cartography) Nachrichten aus dem Karten- und Vermessungswesen, Reihe I, Heft Nr. 118, S. 111- 125. Bundesamt für Kartographie und Geodäsie, Frankfurt am Main, 1998.